It is looking like Saturday will be the day for kitefishing on the east coast. A good opportunity to get out early and catch those schooling snapper. On Friday the entire country will have westerlies and these will be fairly light north of East Cape. On Saturday the westerly winds will continue, they will be increasing in strength in the north and decreasing over the South Island. On Sunday the forecast is for light southwesterlies north of the Coromandel, another excellent day in store for east coast fishers. The wind will be from the southeast for those in the lower Bay of Plenty region. For the rest of the North Island and all of the South Island it is too difficult to predict what the wind will be doing but it is liable to be light breezes. With a forecast like this and the schooling snapper on the east coast we expect to hear some great stories for the newsletter next week. Please keep sending those reports in. I was fishing at Pakiri Beach last Saturday. The sea was calm and there was a light southwesterly blowing. Using a Bottom Longline Rig I put out two sets baited with squid. The day started off very frustrating, it took an hour and a half to get the kite up. I had to take off the skyhook as it was spinning and causing trouble. We knew once we got the kite up over the trees we would be okay. Finally, just as I was about to throw in the towel..... zoom, off she went. Luckily I had already put on the tack rope with the smallest piece of plastic, and straight as a die it went out. Forty minutes for the first set, nothing, eighty minutes for the second set and still nothing. However when pulling it back in we must have caught a log or something as it was incredibly tough going. We moved the kite reel up the beach and managed to pull it free. Totally straightened a 4/0 Target Hook. (may have to bring it in for a warranty claim). Anyway it was a better day than doing the gardening. The family down the other end of the beach did a little better....They caught a crab and a starfish. Not everyone missed out. Mark Honing caught this snapper kitefishing last Friday at Te Arai Point. Thanks for the pic Mark, we hope to have more details about Marks catch for next weeks newsletter. Arrived in Whitianga for Labour weekend about 10:00am on Friday. I decided to try a set. The wind was swinging from the northwest to the southwest. The only place to kite fish had to be Brophys Beach at the north end of Buffalo Beach. By the time we were ready to fish the wind must have been more northwest as I had to tack to the left. Sent the Dropper Rig out with the Nighthawk kite and set 11 hooks, 10 on the mainline and one on a long back trace. I baited up with squid and let it out. The kite went out about 500 metres and then stopped. After a while it started doing this crazy dance which I managed to settle down by applying more pressure to the kite. Eventually the gusts got to much, over 35 knots I suspect, and the spar broke. I began retrieving kite in the middle of that fierce storm that hit most of the upper North Island that day between 11:00am and 2:00pm. There was a tremendous amount of weight on the line. I thought at the time it was only because the kite was in the water. However, about half way in I noticed some splashing about where I thought the kite was. It took some time for me to realise that it was a quite large stingray which suqsequently released itself making retrieval much easier. My wife and I were quite happy with the 2kg snapper we caught because as it turns out this was the largest fish caught all weekend out of five fishers using rods, nets, the kite and a longline. I was fishing at Waiwera last Saturday. Using my Flexiwing Rig I put out one set of 10 hooks. There was a moderate northwesterly blowing and the sea was calm. Baiting up with squid I sent the gear out and caught four snapper up to 4.5kg and one kahawai. An excellent return for one set. While fishing at Omaha Beach at around 10 to 11 o'clock in the morning on Monday I was enjoying a brilliant day. Not so much a sunny day but a brilliant day for kitefishing. It was cloudy and there was 20 to 30 knots of westerly wind blowing straight off the beach. It was the sort of day when you have a really good feeling about fishing. Very similar to the day I caught my 20 pound snapper last year. I set up my Flexiwing Rig with eight hooks, all baited with squid. I started to let it out, it worked a treat and it was out 1000 metres within 10 to 15 minutes. I left it to fish for about 45 minutes. While the gear was out I walked down the beach and asked another man, who was also kitefishing, if he had caught anything. He had caught four snapper between 2 to 3kg snapper on five hooks. That was on his first set. He was using a Flexiwing Kite powered dropper rig baited with squid, exactly the same as me. Around 12 noon I decided to wind in my gear. While I was retrieving I noticed a boat coming around the point to the right of Omaha. It was coming very close to the beach and ended up cutting our kites off. We both lost our kites, rigs, 800 metres of nylon and maybe some fish. The boat was within 200 metres of shore and I know you are not allowed to go more than 5 knots within 200 metres of the shore. The boat was travelling well above 5 knots. So we lost all of our gear except our kite reels and stands. It just goes to show the ignorance of some boaties. I am only 15 years old and my budget is limited. I took my Kite Longline to Porangahau Beach last Monday. I put out one set of 25 hooks and caught two kahawai and three other fish. The sea was slight and there was a moderate westerly at the time. I was using kahawai for bait. Fishing out of Waihi a couple of weeks ago I caught four snapper and two gurnard. 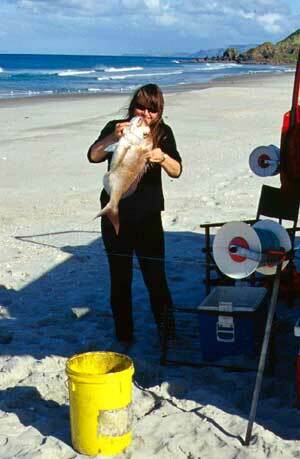 I put out two sets of my Kontiki rig and used salted mullet for bait. The conditions were great for fishing, there was a moderate southwesterly blowing and the sea was slight. A great day to be at the beach. I was fishing with my Kontiki at Whirinaki Beach early last week and caught two kahawai. I put out one set of 25 hooks in the calm conditions and was using squid for bait. Our line got snagged just to the right of the outflow pipeline from the mill. I had to go out in a boat to snap the line and retrieve the kontiki gear. The line is now abraded, do I need to replace it? Ed: Absolutely, for the security of the rest of the gear it would be worthwhile replacing the damaged nylon. The winners of the $30.00 gift voucher for the month of September goes to Steve and Barbara Johnstone of Orewa. The photo is a shot of an excellent Northland snapper taken from 90 Mile Beach. A favourite kite fishing spot for Steve and Barbara. A $30.00 voucher will be out to you very soon. Any information is helpful and assists those not familiar with kite fishing in the particular area to have a more successful kite fishing experience.